A Gynandromorph: This is a case where Arthur is Martha! This appears to be a rather typical-looking Raspy Cricket. 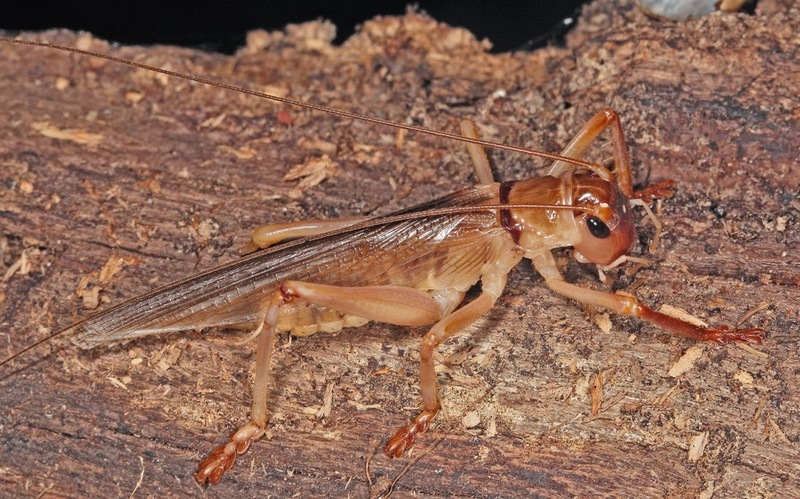 Raspy Crickets are members of the family Gryllacrididae. They are crickets but very different from the average field cricket one is familiar with. 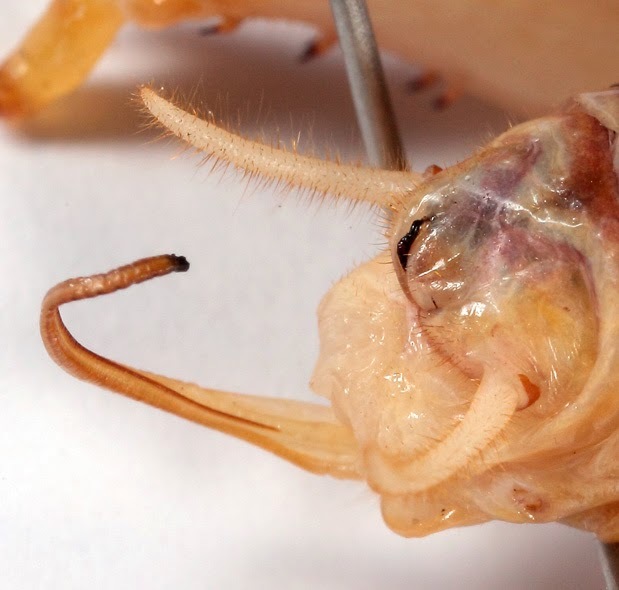 These crickets have the ability to spin silk with their mouthparts. They do this to construct enclosures where they spend the day. They tie leaves together or construct underground burrows that are stabilised with webbing. They even provide the burrows with a cap that keeps them sealed in a waterproof and predator-proof enclosure when danger threatens. Perhaps, the most important feature of an underground burrow in the desert is to reduce the problem of water loss through evaporation. What is interesting about this cricket is that it is a gynandromorph, that is, it is a creature that possesses both male and female characteristics. As an entomologist involved with fieldwork for over 60 years, I guess that I have come across fewer than a half dozen insects illustrating this phenomenon. 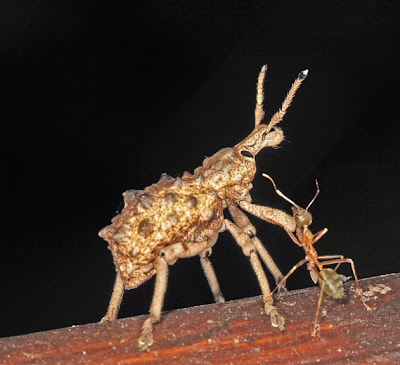 The most spectacular are those that are bilateral, that is, where half the insect is male and the other half is female. Butterflies illustrate this best and can be very spectacular. But not all gynandromorphs are bilateral. The most usual cause for this malady is an "event" early in life at mitosis when cells are dividing and the chromosomes are recombining. Gynandromorphism probably leaves the individual sterile and unable to reproduce. This cricket is not a true bilateral gynandromorph. It probably fits into the "oblique category as will be seen below. Viewing the top of the head and pronotum, one can see nothing amiss. Everything appears normal. Similarly, a frontal view conveys a normal gryllacrdid appearance. Gryllacridids are not known for outward sexual dimorphism except genitalically. In this respect they are truly spectacular, especially in males. The male genitalia displays an intricate array of hooks, claspers and modifications that provide examples of the old "lock and key theory", that is, the male genitalia are of a morphology that they will only work in females that of the same species. This theory has been challenged over the years but it is useful to make a point. In all the gryllacridids that I have examined, the male and female genitalia are highly distinctive. As a result they are the most useful taxonomic characters. 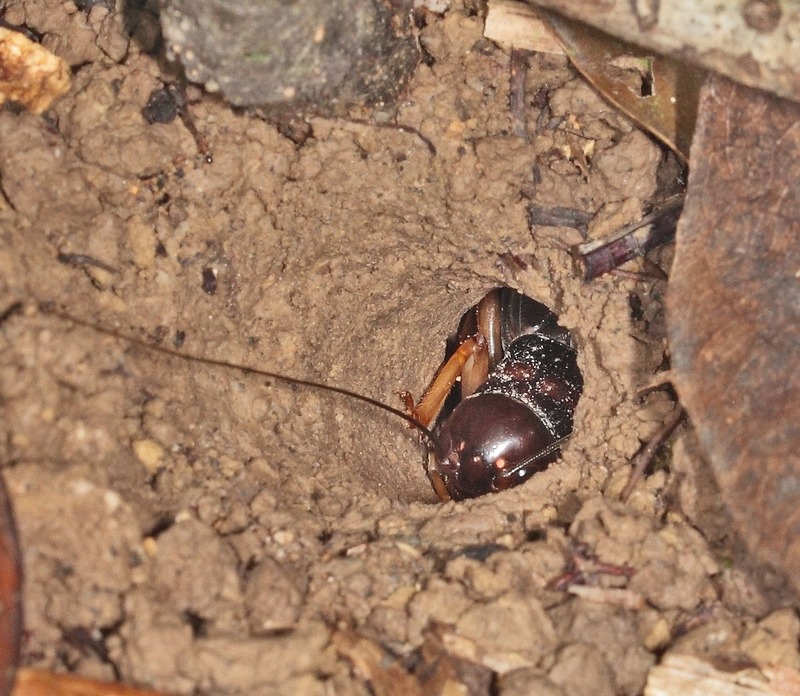 In more typical crickets (family Gryllidae) where males produce song, the wings are structurally modified for sound production. Gryllacridids also produce sound but in a different way. Individuals of both sexes in all stages of development can produce rasping sounds--hence the common name. Both sexes also "rasp" during courtship. 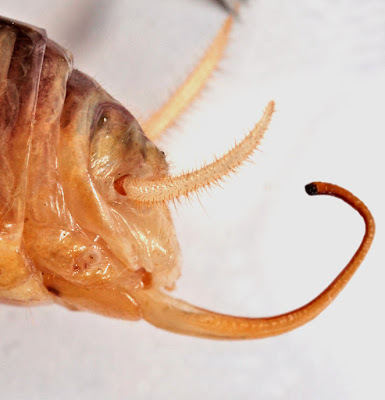 They produce rasping sounds by inflating the abdomen slightly and rubbing pegs on the abdominal segments against a raised series of minute bead-like projections found on the inside of the adjacent hind femur. Other related families produce sounds in that same way. In this specimen the line of pegs are on the first and second abdominal segments. These pegs are actually modified hairs. They are at least generically characteristic and many were reviewed in several Australian genera by Rentz and John (1990). The inside of the hind femur. 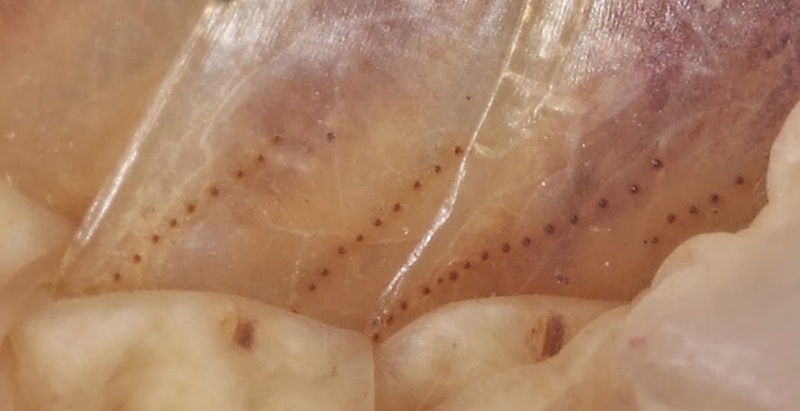 A close-up of the bead-like structures that are rubbed against the pegs on the adjacent abdomen. Back to the odd features displayed by this cricket. This individual has a part of an ovipositor. 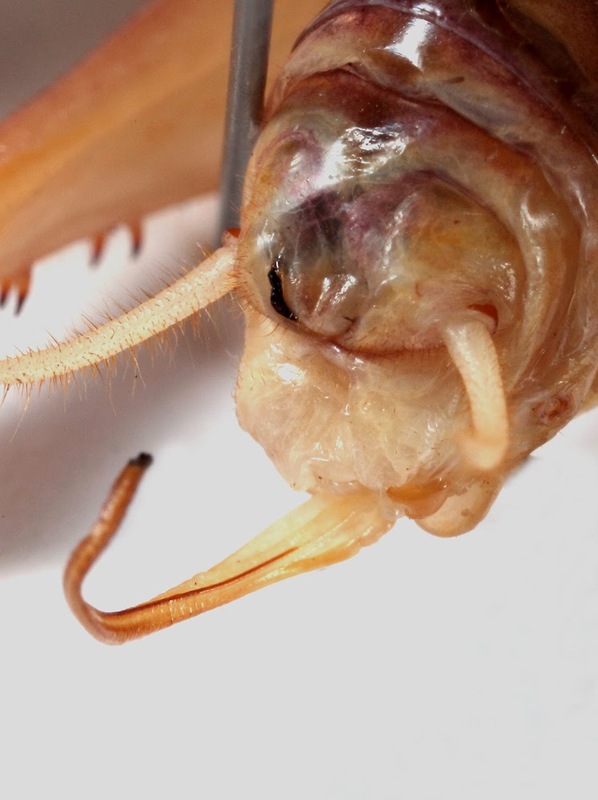 The normal ovipositor has two main parts that are divided down the middle. 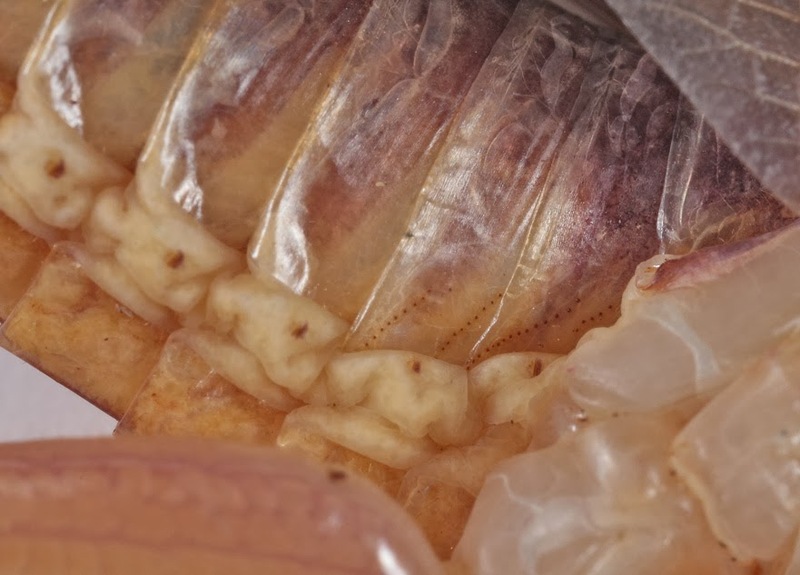 In this specimen we see the right side of what appears to be the right half of the ovipositor. Gryllacridid ovipositors are normally straight and long, about half the length of the insect itself or even longer in some species. 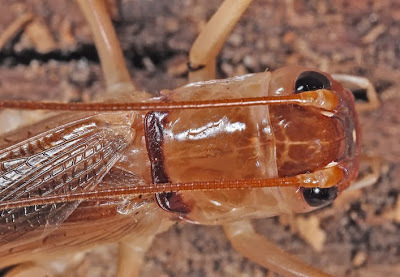 Since this cricket had to undergo several moults in becoming and adult, it appears that the ovipositor did not develop properly and part was lost or broken after moulting. This shows that there is just a half an ovipositor. The left half is missing. The V-shaped plate at the base of the ovipositor is the subgenital plate. this strucutre is normally sexually dimorphic and if this were a true bilateral gynandromorph, each side would have a very different structure. But here it appears symmetrical. Note the little brown sclerite at the base of the filamentous cercus on the right. These photos show the abdomen from above. 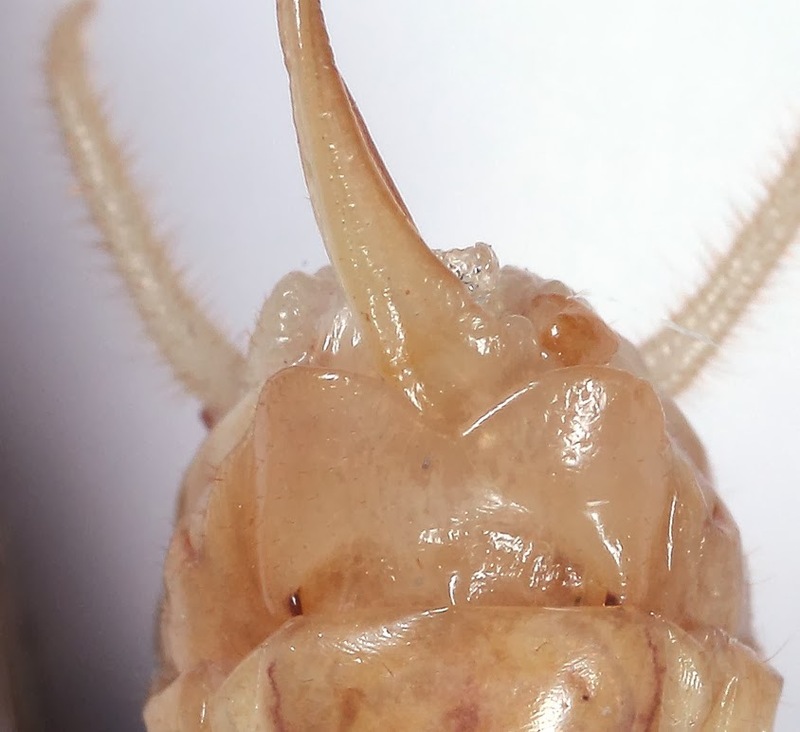 The ovipositor is deformed, the right half which is twisted and pointed to the left. The white fleshy bits are usually possessed by males, females have a more sclerotised tip of the abdomen. This is unusual in this example. The small sclerite on the right at the base of the cercus may be a significant part of the normal male genitalia and the black ridge on the left is a feature found in males of some species. This is a most unusual gynandromorph. The internal morphology would show testes on one side and ovaries on the other if this were a bilateral gynandromorph. These features have not yet been examined on this specimen. But what genus and species is this cricket? Based on the arrangement of the pegs on the abdomen, I would place it in Mooracra. Should we find additional specimens at this locality, we can provide a more authoritative identification. There is a remote chance that his cricket is not a gynandromorph at all. It's deformity may be from some other cause such as parasitism. If so, this is the first time I have found such an anomaly. Rentz, DCF, John, B. 1997. Studies in Australian Gryllacrididae: Taxonomy, biology, ecology. and cytology. Invertebrate Taxonomy, 3: 1053-1210. The Irresistible Force is An Immoveable Object! This weevil spent the better part of a day perched on a balcony rail. It was the constant source of attention to passing Green Tree Ants (Oecophylla smaragdina). 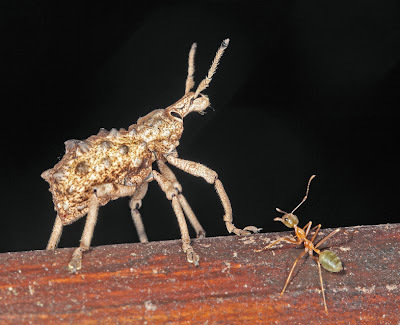 Something conveyed to the ants that this was a potential food item, but try as they might, they could not budge the weevil nor gain entry to any of its soft bits. We have dealt with this before in this blog with pesty Orchid Weevils unable to be overcome by interested jumping spiders. Anyone who has tried to pin a weevil for an insect collection will be aware at just how hard the integument is. Inserting a pin into some of the larger species is almost impossible. This toughness seems to afford protection from small predators. One might expect the head to have some soft bits where the ants could gain a purchase but no. Even the antennae were rigid and tough. It seems the only soft parts exposed by the weevil are the tarsi. These were completely ignored by the ants. The weevil remained in its "staid" position all day but was gone overnight. The ants are primarily diurnal in their activities! Cephalogryllus tau calling song a video by orthop1 on Flickr. The cricket producing this intensive sound was about 25 cm (10 inches) from the microphone. It is Cephalogryllus tau Alexander & Otte, a member of the Gryllidae; subfamily Gryllinae. The sound is ear-piercing, even to these old ears when up close. The crickets seemed randomly spaced but fairly close together. The background sounds are largely of this species. 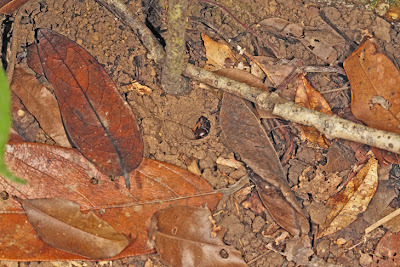 The beeps towards the end of the recording are of a small frog. 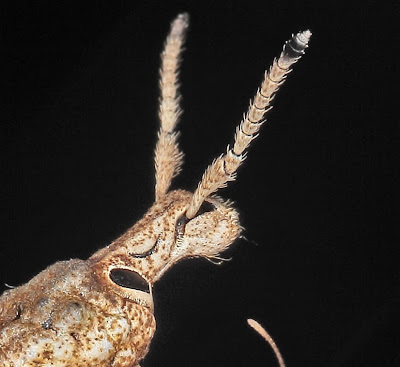 The antennae are extended from the burrow and wave back and forth. The short-winged cricket is adapted for a tight burrow. Long wings would require a larger burrow and that might lead to a greater array of predators like bandicoots and geckos. During the day, the burrows are closed by the crickets and are reopened after dark if the night is suitably humid. Why do the crickets sing? Well it is widely agreed that crickets sing for several reasons. The most common reason is the sounds are specifically designed to attract mates. Males produce the call. 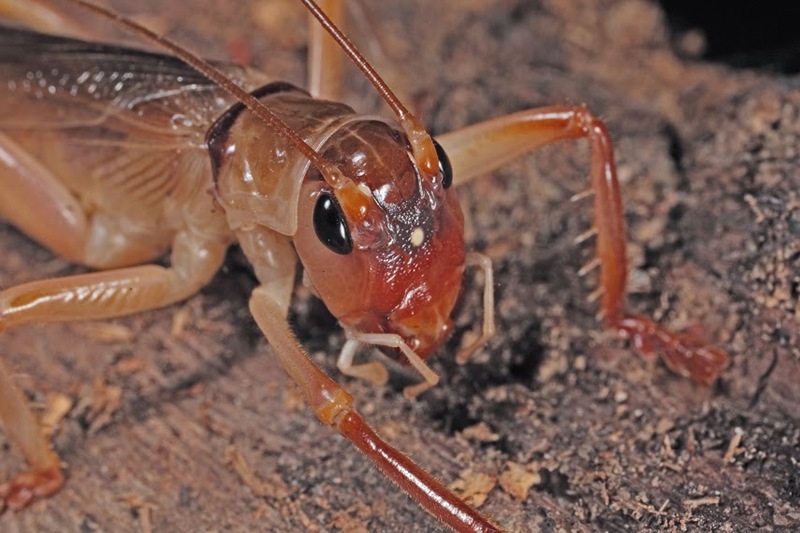 However, territorial or aggressive calls have been observed in many crickets. Since C. tau is a relatively recent discovery, nothing is known of its biology other than it lives in burrows. In this genus the females are very short-winged, the tegmina only about 1/3 the length of the pronotum. They produce no sounds. Presumably, the females wander about on the surface of the ground seeking singing mates. However, no females were observed on the evening the recording was made. Some mention should be made of how crickets produce song. Almost all crickets and katydids produce sound by rubbing their wings together and that is almost the exclusive domain of males. In katydids it is usually the left wing (tegmen) that is rubbed over the right. In crickets, for some reason, it is the right that is rubbed over the left. Sounds produced in this way are called stridulations. This is called the file and scraper method. The analogy is similar to running your thumbnail across the teeth of a comb. The loud sound produced by G. tau is surprising considering the short, stumpy size of the wings themselves. The current disastrous bushfires in New South Wales are the focus of attention because of the odd time of their occurrence (this is spring in the southern hemisphere and bushfires are usually a summer phenomenon), their extent and the large number of dwellings that have been destroyed. With all that happening in the south, it was sad to see what has happened locally in north Queensland. This is what you see for many kilometres when you drive north from Lake Mitchell towards Mt Molloy. The area has been completely burnt and for what? 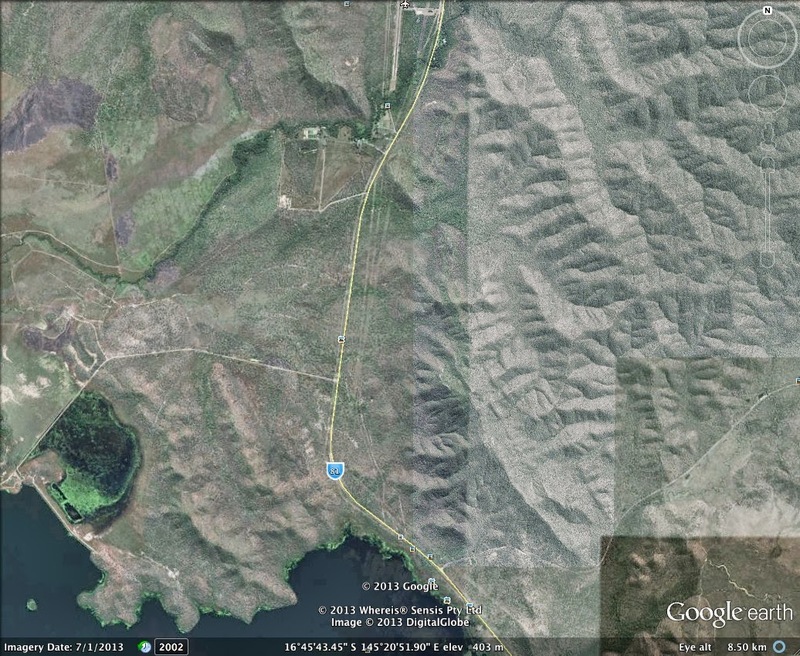 This area is mostly fenced grazing land. It is burned annually. There are few birds and not many mammals except a few kangaroos that return when the understory of introduced grasses germinate. To a biologist, this is wanton habitat destruction. Note that all leaf litter has gone. This means that the soil biota- both plant and animal- has been destroyed. A recent article puts a different slant on this increasing problem. 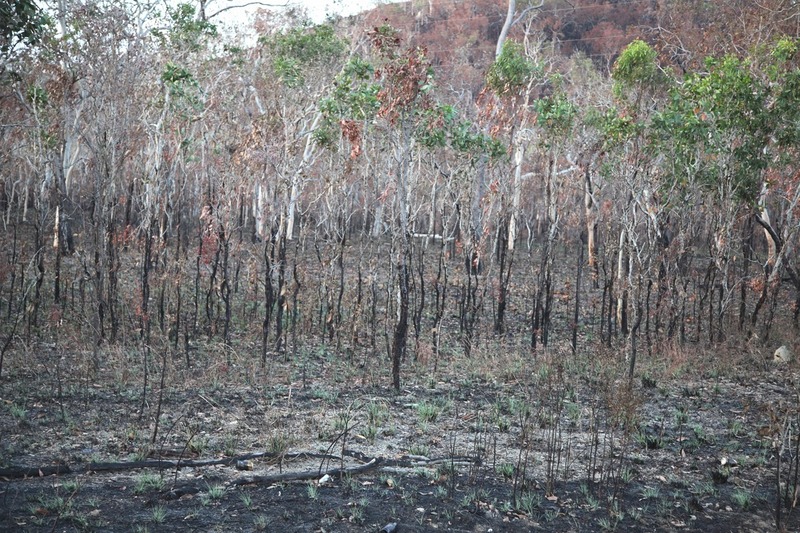 It states that 60% of bushfires are the result of arson. Some 40% of those are accidental. Further statistics are important. The offenders are adolescents and most live in the bush. If they are "keepers of the land", they should know better. Teenagers have been caught setting fires in New South Wales simultaneous with the big fires that continue to rage. 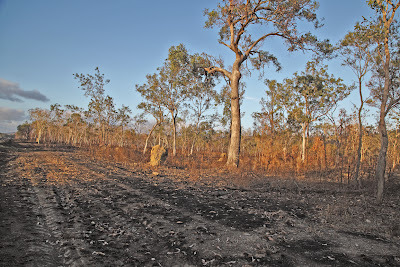 The fires north of Mareeba are very extensive. 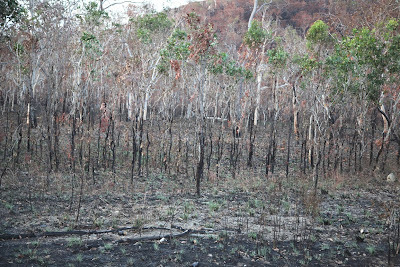 In some places the burnt trees range over the hills and valleys are far as the eye can see. And the fire reported in the recent blog below was not far from where these photos were taken. The "Fire-fighting industry" uses an array of statistics to promote its "reduction burning" during the wet months. A misguided individual has written an article justifying reduction burning stating that the leaves of these trees and shrubs are built for burning and that they don't disintegrate in the soil. The soil is loaded with insects and fungi that reduce the leaves, dead wood and other detritus returning it back to the soil for food for trees and shrubs. We don't have to routinely burn. In most cases it just replaces the undergrowth with grasses which readily catch fire in the dry season. As an alternate we should probably begin to consider some areas too risky for human habitation and not build there. 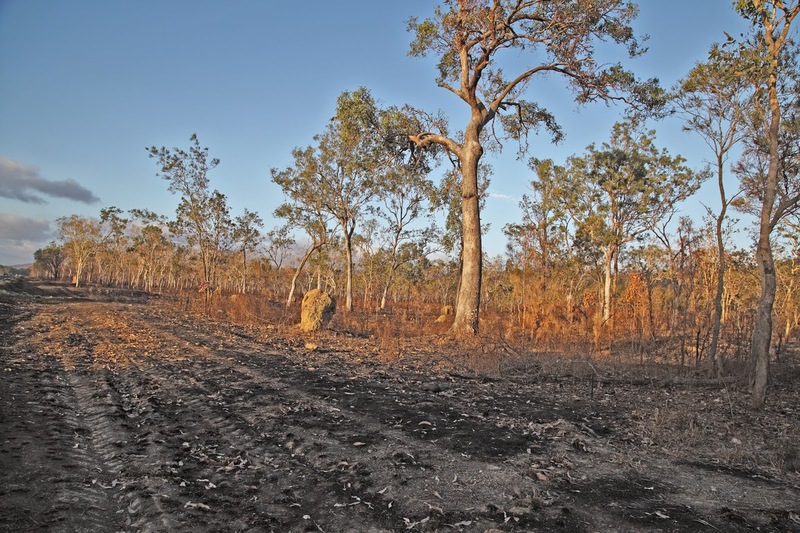 This requires some drastic action by local councils and will certain affect their tax base but as the population increases, it may be too dangerous to live in bushland. But back to the above statements in the previous article. The author says that most recovers in 5 years as indicated by aerial photographs but admits that some things take longer. Probably most of the biota takes longer. Sure the eucalypts that are not killed by the fire can often sprout new growth. But what about the shrubs and small plants with shallow roots like orchids and native annuals. They may never recover, especially if the area is burned annually or repeatedly. And there would certainly be other native trees that cannot withstand continuous burning. Seedlings have a very tough time under this regime. Insects are very slow to return and those that do are usually the most pestiferous ones. Many of the interesting endemics may not be seen for years. As a distressing aside, I was told that the person who lit the fires in the Mt Molloy area was well known to the locals including the police. He does this every year. Why is the question. How many nesting birds, mammals and reptiles has he sent to an early grave? People like this should be disqualified from owning property in the bush and should receive counseling to help deal with their anti-social problem. These comments are bound to be controversial because landowners feel that they should be able to do whatever they want with their land. There is always a commercial aspect that dominates. And these days people with a "green outlook" have been damned by shock jocks and certain politicians. They seem to have convinced the general public that a "green outlook" is not in the national interest, whatever that is. Sure there may be some need for reduction burning in some areas but not to the extent that the "fire industry" would like us to believe. What is needed is more vigorous prosecution of arsonists. And the penalties need to be increased to the extent that it would be unthinkable to consider starting a bushfire. We need more education about the wonderful creatures and plants that live in the bush and how important it is to protect and cherish them. A recent trip to the Daintree region, Cape Tribulation, north Queensland resulted in a walk during the day on the Marrdja Boardwalk. This should not be missed if visiting the area. It's a meandering track through forest and mangrove. It would be perfectly safe and convenient during rainy periods because it is elevated and has a combined rubber and wood surface so you won't slip or get muddy. You can see an assortment of mangrove biota including a variety of trees and shrubs and crabs and fish. While most people were concentrating on Fiddler Crabs, fish and the like, I looked up and discovered chains of craneflies (family Tipulidae). 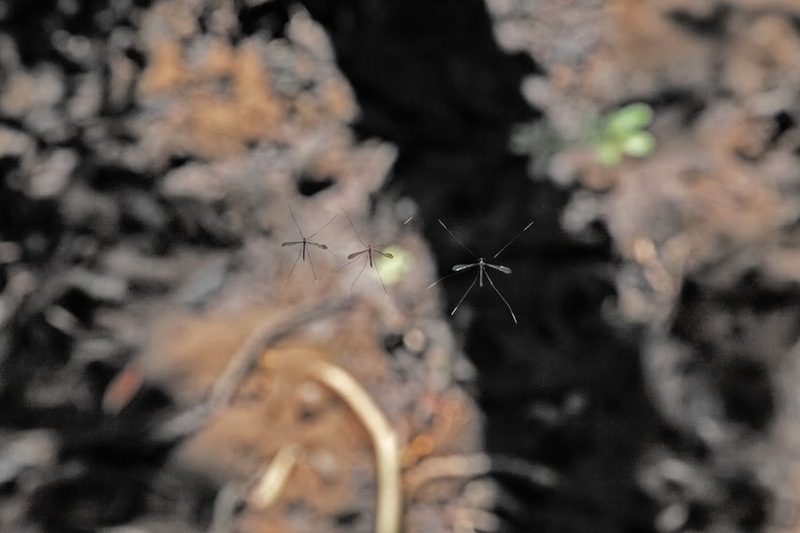 This is not the best photo I have ever taken but it shows three flies out of about 20 that were attached to one another by their tarsi. I saw a number of these chains and many were waving in the windy conditions making photography even more difficult. But what was the point? What were they doing?